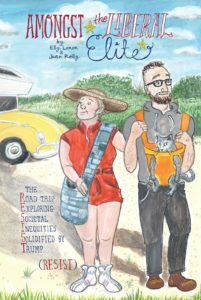 When Elly Lonon and Joan Reilly got word that powerHouse Books wanted to publish their graphic novel, Amongst the Liberal Elite: The Road Trip Exploring Societal Inequities Solidified by Trump (RESIST), in January 2018, they were absolutely thrilled. But then reality barged in. Not only did the publisher want the book completed in just five month to peg the book’s release to the midterm elections—but the same week that they signed the contract, Reilly was diagnosed with an aggressive form of brain cancer that necessitated surgery, radiation, and chemo. “Our mantra,” Lonon told Lilith, “quickly became, ‘don’t let the perfect be the enemy of the good.’” She spoke by phone with Lilith in early November and covered the book’s evolution and its hilarious depiction of Alex and Michael, a well-meaning, straight, white couple who are nonetheless often clueless about their class and race privilege. Eleanor J. Bader: Amongst the Liberal Elite is an expansion of a column by the same name that you’ve been writing for McSweeney’s Internet Tendency since 2016. How did that column come about? Elly Lonon: I went to the Erma Bombeck Writer’s Workshop in March 2016 with a copy of my unpublished book, Lymphomania, a memoir about having had non-Hodgkin’s Lymphoma in 2008. The culmination of the conference is an event called Pitch-A-Palooza in which I competed. The format is that you have 60 seconds to explain your idea to Arielle Eckstut and David Henry Sterry, authors of The Essential Guide to Getting Your Book Published. The prize is that they’ll work with the winner to get their book published. I won, and their initial advice was for me to find a platform. They suggested I pitch to Modern Love, McSweeney’s, and The Moth. By that point I’d already accumulated a slew of rejections from Modern Love and had not been brave enough to pitch elsewhere, but I decided I’d try McSweeney’s and pitch with the confidence of a mediocre white man. I sent my first Amongst the Liberal Elite column in right after Trump was elected and have been contributing stories about Michael, a Jewish man, and Alex, his non-Jewish wife, ever since. EJB: How did you move from monthly column to book? And why a graphic novel? EL: Readers of Amongst the Liberal Elite had been asking for more so I’d been thinking about it. I’m also a graphic novel junkie and after I wrote the road trip column—a story in which Alex and Michael decide to blow their tax refund on a trip across the US to try to figure out why people supported Trump, with numerous stop-offs at tourist traps including six sites billed as the world’s largest frying pan, the world’ largest rest stop, and a 55-foot Jolly Green Giant, it sort of steamrolled. A column is such a short space. The book gave me a longer arc to talk about politics and activism. EJB: Alex and Michael clearly love each other and are in the relationship for the long haul. At the same time, they constantly bicker and some of the jabs surprised me with their venom, especially when Michael accuses Alex of anti-Semitism. EL: I patterned Michael after my friend Jen whose Jewishness is more of a cultural identity than a religious practice. I wanted Michael to have that. At one point he calls Alex a ‘Jew-hating albatross of a wife.’ I wanted his emotion in that moment to be as extreme as it could be. That comment was every horrible thing he could say to her all at once. Of course, Alex is not Jew-hating whatsoever. But it’s like when my husband calls me a drama queen. It makes me angrier than anything else he could say because women have always been accused of being overly emotional and hysterical. This is actually how long-term couples fight and it can get pretty nasty. I wanted to represent that. EJB: Alex and Michael are pretty extreme, a least initially, in their quest to be politically correct. They try to talk the talk and walk the walk, but they’re still hilariously over-the-top. I assume this was intentional? EL: YES! I wanted people laughing at the beginning of the book, but as the story progresses Alex and Michael became a little more earnest and relatable. I thought it best to pull readers in with humor and then have them slowly realize how close the pair are to most liberal or left-leaning white people. At the same time, I think Michael would be amazing at a party and you’d want Alex on the picket line with you because she’d have everything so organized. And odds are, there are probably people who think you and I are as ridiculous as we think Alex and Michael are. EJB: Were you and Joan friends before you collaborated on the book? EL: No. We did not even know one another; she was suggested to me. In the summer of 2017, I went to MoCCAfest, a two-day cartooning and illustration festival in New York City. Joan was there and I introduced myself. I was as charming as I could possibly be because I was already smitten with her work and shortly thereafter, we got together for coffee. She lives in Pennsylvania, and I live in New Jersey, so we met at a bookstore one hour away from where she lives and one hour away from where I live. We immediately clicked. She saw so much in Alex and Michael. I know it sounds like a cheesy analogy, but if I was the nurturing mom, she was the challenging dad. We are truly collaborators, a harmonious partnership. EJB: Joan’s cancer diagnosis must have been devastating. My agent also represents Tom Hart, whose graphic memoir, Rosalie Lightning, about his daughter’s death, is a staggering work. Tom teaches an illustration workshop so we asked him if he had any students who might want to join our team. It was through him that we met Miguel Yurrita, who did all the pencil work. We also found Sarah Oleksyk who was able to do the thumbnail sketches. Joan would go over Miguel’s work and we then took Joan’s handwriting and turned it into the font that is used throughout the book. The only snafu was that we could not get everything done fast enough since we had such a tight deadline, so we approached illustration teacher and brilliant comics author Lauren Weinberg who put us in touch with Theresa Chiechi. Theresa works digitally and did the inking. Out little team quickly tuned into the Ford Motor Company of graphic novels – but without the racism. Meanwhile, I kept updating the dialogue to keep it as timely as I could. EJB: It sounds like quite a whirlwind. Was it easy to get Amongst the Liberal Elite published? EL: Surprisingly, we got seven offers of representation from potential agents, but when it came to publishers, at first no one was interested. Some said they wanted Alex and Michael to be angrier, but I don’t see them as angry. They are optimistic in their hearts about our political future. Other publishers said that they thought it would become outdated really quickly. But powerHouse is small and independent so they can move fast. Basically, they said that if you can get this to us on time, you have a deal. The response has been good. I’m now in the throes of a 13-city book tour and I’m not only going to big cities. I’m traveling to places like Asheville, Chapel Hill, Durham, and Greensboro, North Carolina; Austin, Texas; Maplewood, New Jersey; and Naperville, Illinois. EJB: What do you hope readers will take away from reading Amongst the Liberal Elite? EL: I hope people will see something of themselves in Alex and Michael. I also hope that the book will give them the courage to make mistakes. I know the book won’t change the world but I’d like to think I’m reaching people. I’m so inspired by folks who work tirelessly in phone banks, canvassing, and organizing the resistance to Trump. I want the book to give them a moment of respite, a little levity, and the energy to keep doing progressive political work far into the future.